There is an update for Kim’s iThings. On August 15, 2015, North Korea switched to a new time zone, turning its clocks back by 30 minutes to mark its liberation from the Japanese at the end of WW2. Bells rang out in the capital Pyongyang at midnight as the new time zone came into effect. 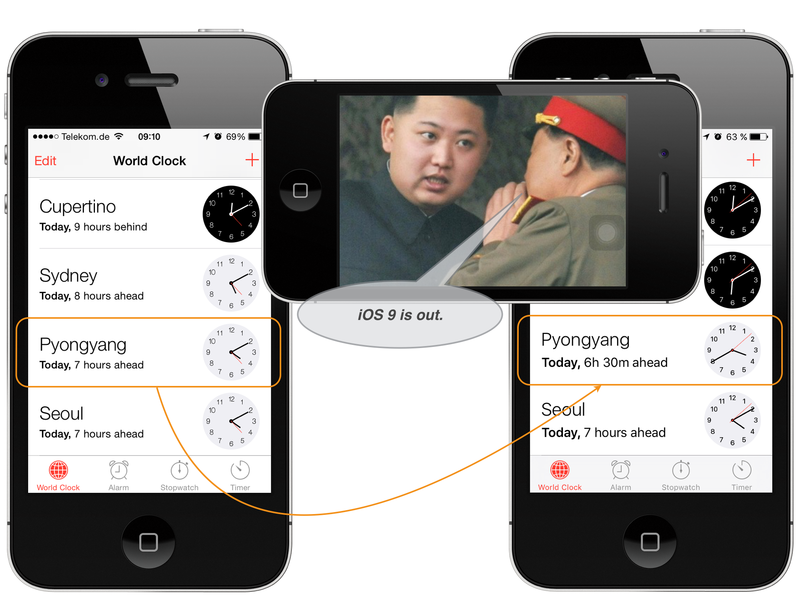 Unfortunately Kim did not inform Tim about this innovative move so iOS devices showed the wrong Pyongyang Time. The world of bliss returned because special forces now installed iOS 9 on Kim’s iThings. What can North Korea learn from this history-charged issue? After upgrading the time zone of their iThings people in power should upgrade their conception of the world as well. That’s one small step for a man developer, one giant leap for mankind Kim Yong Un. A big THANKS to the Cupertino guys.